Will snow in parts of northeastern US Thursday be winter's last hurrah? A storm will bring snow and a wintry mix to the interior northeastern United States on Thursday, but is this winter's last hurrah for the season? The fast-moving nature of the storm will limit the amount of accumulating snow. A general coating to an inch or two of snow is likely from northern Ohio and parts of northern and western Pennsylvania to western, central and northern New York state and central and northern New England. Because of the time of the year, paved and concrete surfaces tend to absorb a good deal of the sun's energy by day and remain at a higher temperature than grassy and elevated surfaces at night. Most of the accumulation will be on non-paved surfaces. However, where snow falls at night or over higher elevations, some roads, sidewalks and parking lots can get slushy. Motorists should be especially cautious on bridges and overpasses. Along the Interstate 95 corridor, from Washington, D.C., to Baltimore, Philadelphia, New York City, Boston, Hartford, Connecticut, and Portland, Maine, all or mostly rain will fall. It is possible, where and when it rains hard, that wet snowflakes or a dash of sleet may be mixed in. A wintry mix of mostly rain and some wet snow and sleet is more likely in the I-81 corridor of northern Virginia, northern Maryland and south-central Pennsylvania. In the wake of this storm, some changes will take place in the overall weather pattern. "Areas from the central Appalachians to southern New England on south should be done with any snow for the season after Thursday's storm," according to AccuWeather Lead Long-Range Meteorologist Paul Pastelok. 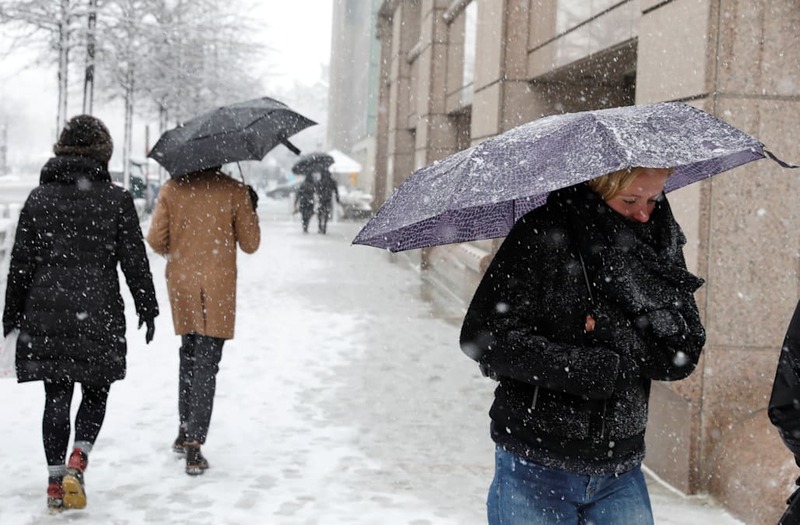 "People from northern New York state to northwestern New England may still have another snow event or two into May," Pastelok said. Much of the region can expect a stretch of dry, sunny weather from Friday through Monday. The nighttime and early morning hours will be chilly and frosty in many locations, but strong late April sunshine should make the afternoon hours tolerable for even those who mind a slight chill. Those hoping for a stretch of dry weather for outdoor projects will receive their wish. However, the next storm is likely to come from the South and not from the Rockies or the Upper Midwest next week, so precipitation will come in the form of rain rather than snow. A period of cloudy and rainy weather is likely to spread overmuch of the region from Monday night through the middle of next week. Beyond the storm during the middle of next week, temperatures are likely to trend upward, including nighttime lows. "From late April to early May, we are getting more confident that a several-day stretch of warmth is in store for the Northeast," Pastelok said. "There can still be some cloudy and cool episodes for the mid-Atlantic and spotty snow in the northern tier moving forward in May." At least it now appears that the weather pattern in the Northeast will begin to ascend the stairs out of the relentless snowy and cold basement in the coming days. Pastelok cautioned that gardeners should keep in mind that since the overall pattern has been running about a month behind schedule, with this April behaving more like an average March, that frosts may occur well into the spring in the Northeast.